New book about the history of the Green Bay Fire Department. Where was the first professional fire department? Where was the first American fire department? What is a "Fire mark"? The Maltese Cross and the Fire Service. Why do they call it a "Box Alarm"? What is a "Box" or "Joker Box"? Why do they call it a "Second Alarm"? Why do they call it "Tapped out"? It depends. How do you define a "professional fire department"? Note: Today all firefighters are considered "professional". They are divided between "volunteer" or "career" categories. Both are trained and have the same responsibilities and equipment standards. The first full time department, in western culture, might have been in Rome some 2000 years ago. They had people who were selected to roam the city and not only sound the alarm and put out fires but enforce fire codes (sometimes with corporal punishment). These were called the "Corps of Vigiles". Unfortunately they were not exactly a "paid" department. Augustus Caesar formed this corps from slaves. There are many claims to who would be the "first" "modern" "professional" fire brigade or department. What is "modern" or what is "professional"? Credit for the first "professional fire brigade" is often given to Napoleon Bonaparte. While French emperor, he ordered that a division of the French army known as Sapeurs-Pompiers be used to protect Paris with 30 manual fire pumps around 1800. But there were people who were paid to provide some form of fire protection or suppression service, in Paris, many years prior to that. In 1699 François du Mouriez took interest in a better pump, fire hose and some other advancements, and provided 12 fire pumps to the city of Paris to become the first "fire chief" (director) of des pompes de la Ville de Paris in 1716. The French fire brigade was known as, "Compagnie des gardes-pompes" (literally the "Company of Pump Guards"). The French word for pumper, "pompier" became the name for French firefighters to this day. On March 11, 1733 the French government proclaimed that the service of the fire brigades would be free of charge. Prior to this there was a fee and people often avoid calling in order to avoid being charged. Edinburgh, Scotland, claims to be the first organized municipal fire brigade in the world, when the Edinburgh Fire Engine Establishment was formed in 1824, led by James Braidwood. London followed in 1832 with the London Fire Engine Establishment. Clicking on a link about James Braidwood proclaims that he "is credited with the development of the modern municipal fire service." But this ignores the fact that Boston, as mentioned below, had a crew who was paid to maintain their one pump and respond to fires as early as 1678 and the fact that London established "fire companies" after the Great Fire of London in 1666. But in fairness, James Braidwood probably did contribute some major advances in firefighting. Prior to him, most firefighting was done from the streets. He pioneered and developed the strategy of entering and fighting fires from within the structure. One might assume that this advancement was made possible due to the invention of better pumps in 1725 and dependable leather fire hose in 1672. The first American (volunteer) fire department company is often credited to Ben Franklin, around 1736, in Philadelphia. This started as a "club" or co-op, to protect each other's homes in the event of a fire. But there were organizations resembling firefighting "clubs", also known as "Mutual Fire Societies" in Boston prior to this. Boston also had "Firewards" as early as 1711. As early as 1678, Boston had some fire fighting equipment and a paid crew to maintain it and respond to fires. In 1648, New York, and a few other cities, had a volunteer "rattle watch" who patrolled the streets. If a fire was discovered these people would sound an alarm and help organize bucket brigades. As early as 1731 there is a record of the City of New York purchasing fire apparatus. This was a hand pump/brake bar engine. There is a photo of this engine on the FASNY Fire Museum website. Franklin noted in his own newspaper, in 1735, that Boston had "a club or society of active men belonging to each fire engine, whose business is to attend all fires with it whenever they happen." This may have been one of the concepts that help him go down in history as one of our first, if not THE first, fire chief. The difference between Ben Franklin's "fire brigade" and the other co-ops, of clubs, is that he saw the advantage of protecting all the property of the community and not just those who had joined together to help fight each other's fires. 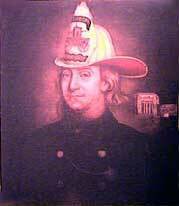 Franklin formed a fire brigade that became know as The Union Fire company. This was made up of about 30 volunteers from the community. These men met monthly to discuss fire fighting techniques. But this was not the only "fire company" in Philadelphia. Soon afterwards there were others known as, the Britannia, the Heart-in-Hand, the Fellowship and others. Many prominent early Americans were volunteer firefighters. After all, in most cases, if people didn't organize and form some kind of co-op, there wasn't anyone to help keep the town from burning down. George Washington was a volunteer in Alexandria, Va. and purchased a new fire engine to donate to the town. While it was more true back then, volunteer fire houses are still a major organization in many communities. Volunteer departments hold BBQ's and other events to raise money. Usually the prominent leaders of a community are members of the fire department. It is less true today, but 150 years ago, the volunteer fire departments were often powerful political machines in many towns and cities. Probably the most famous example was Boss (William Marcy) Tweed of Tammany Hall Fame who started as a member of the "Americus" (sic) Engine Company Number 6 ("The Big Six") in New York City. The movie, The Gangs of New York, show this period of time. During the Civil War, entire fire companies or departments would join up and many became the elite Zoave battalions. The Civil War is often credited with helping to establish the fire department rank system that exists today. While fighting in the war, the leaders of the fire brigade received rank and continued to be known by that title long after returning home. See: Ranks and Organization. Between 1800-1900 many American cities suffered devastating fires and realized that something had to be done. More and more cities established government sponsored fire brigades. Prior to that, fires were fought by volunteers or private companies. Some of these private fire brigades were freelance while others were owned by insurance companies. See: "Firemark" below. 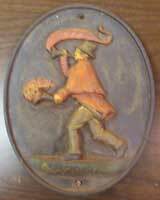 Over a hundred years ago, this was a round (or other shape) iron, copper or lead emblem that was usually placed, on the wall, near the front door of a structure. It denoted the insurance company who had a policy on that property. It was usually made of enough metal to be able to withstand a fire. The earliest fire marks may have been created soon after the Great Fire of London in 1666. After this fire, London created an insurance system and "fire companies". Once you paid your insurance and affixed the fire mark to your structure, you would have the services of one of the city charted companies. 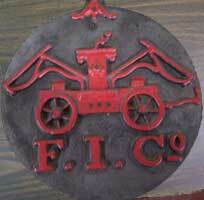 Fire marks (insurance company marks) were used in the U.S. from about 1750 to around 1900. In the early days of the U. S., there were no municipal fire departments. Fire brigades were sometimes either owned, or paid, by insurance companies (or assurance companies) or supported by the community. Some stories tell that in some communities the fire brigade only responded to protect the property of those who had the insurance who owned this fire brigade. In other cities the fire brigades might have been independent companies. The story you hear, tells of the money going to the fire brigade who was successful in staking a claim on the property, which was on fire. One method of claiming a structure was to place a ladder on it. The first company to do so was allowed to fight the fire and was therefore paid by the insurance company. As you can imagine, there were problems with this system. Fire companies would have people whose main job it was to (A) ladder the building and (B) prevent the other company from doing so. There are many, apocryphal, stories of different fire brigades being involved in fist fights, in the front yard, while the structure burned. The fire marks shown above represented the companies listed below. 3. Philadelphia Contributorship for the Insurance of Houses from Loss by Fire. First issued 1752. Today, fire stations and apparatus are most often numbered as they are put into service. 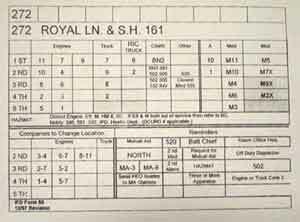 When a department builds their sixth station and puts their sixth engine into service, it is naturally named "Engine 6." But it wasn't always that way. And in fact, the larger and older departments still may not number their stations. Years ago fire apparatus was so expensive and so prized that they were christened or named like boats. 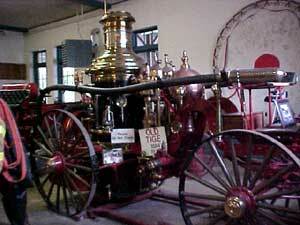 The Dallas Fire Department still has a vintage steam pump in it's museum called "Old Tige". (One of the few in the country to survive the "scrap campaigns" of WW II.) This was named after the mayor of Dallas, (W. L. Cabell) in 1884. The station where the men, who used this piece of equipment, were stationed at "Old Tige's" house. Firefighters don't work at a building called "Number 3" they come to work where Engine 3 runs out of. For many parts of the country, it is not Station Three but rather Engine 3's house. The station might be referred to as, "The Washington Avenue Station." Even if truck 47 is at the station with Engine 3, the "truckies" will often say that "Truck 47 is at 3's." Note: It's pronounced as in "Tiger". This person was known as being tough as a tiger. His nickname was "Tiger" which was shortened to "Old Tige". Chicago had several engines named for individuals as well. These include: "Long John #1" "Fred Grund" and the "R. A. Williams". For more information on the history of fire apparatus go to our page on the subject. See: It's Not a "Fire Truck". One can easily find a hundred web sites that will tell you that the symbol of the fire service comes from the "Knights of Malta" and their battles with Ottoman pirates or the Saracens. They were first know as "The Knights of St. John the Hospitallers." The story is that these knights wore a cross on their tunics and that the Saracens used fire as a weapon against them. All of this is true. There were many of these knights who risked their lives to save their comrades or structures from the fires. But there is much more to the story than that. These knights were incredibly brave and one battle shows them fending of an attack against unbelievable odds. After maintaining and defending the hospital in Jerusalem, they eventually moved to Malta and built large fortifications, including St. Elmo's Fort. Finally they acquired the name, “The Knights of Malta”. From Malta they launched attacks on the Barbary Pirates and became enemies of the Ottoman Empire once again. In 1564 Suleiman again set his sights on the knights. He sent his armada of over 170 ships to Malta with over 40,000 well trained troops and many thousand more slaves and mercenaries. Malta endured many sieges starting in 1565, but always remained victorious. An amazing account of the siege of Malta can be found HERE. In his book "Badges of the Bravest" Gary Urbanowicz states that the first use of a Maltese cross was adopted by FDNY in 1865. In Brooklyn they apparently adopted it in 1882. As mentioned elsewhere on this site, the Civil War had some influence on the traditions of the fire service. We can probably all agree that the firefighters emblem is an attractive design. It is unique, and does an excellent job of representing that, whatever it is attached to, is fire service related. To read a ridiculously long paper on heraldry, the Maltese cross, and the Knights of St. John, go HERE. Why do they call it a “Box Alarm”? This refers to the "Box System". Some alarms, such as a car or grass fire, did not get a full "box" alarm. These kinds of calls were often called still alarms. But even today many departments still use the Phantom Box System. What is a “Joker Box” or telegraph alarm box? 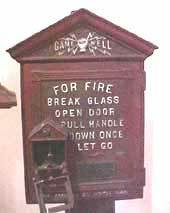 For over fifty years this was a name given to the primary means of dispatching fire companies in many major cities of the U.S. and U. K.
Fire Alarm Pull Box and Watch Desk. at the Dallas Fire Dept. Museum. If you look closely you will notice that there are no zeros used in this system. How would you ring a zero with a bell? After the fire the chief, or his driver, would use a key to open the pull box, rewind the spring and reset the system. Note: Just like with apparatus and just about anything else, terms differ from place to place. While some cities used this system for decades, many never used it. Other cities used telegraph in other ways. For example: A central dispatcher may be the primary means of sounding an alarm through a telegraph. Some cities had multiple telegraph wires going to each station. The relative size of a department often affected exactly how the system could work or if they used it at all. More about Boston's alarm system, and the history of telegraph alarms, here. Why do they call it a second alarm? This goes back to the Box System as discussed above. 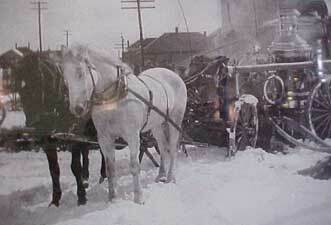 If a "second alarm" was decided to be necessary, the battalion chief, or most often his driver, would go to the fire box on the corner and send the alarm though the telegraph wire. He would do this by sending the box number then he might send a signal like two rings and eleven rings. This is why second alarms are still called "2-11's". A third alarm would be a "3-11" and so on. (In Chicago and some other cities.) See "multi-alarms". 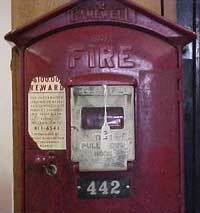 Once telegraph alarm systems were no longer the primary means of dispatching fire companies, another method of knowing who was "first up" was needed. This was simple. Just pretend that a box still existed on any particular corner and list the stations closest to that imaginary box. This is called a "Phantom Box" system. If you moved a station or the city grew, just establish more or different locations for these phantom boxes. A map located somewhere would have all the "box" locations on it and there would be a set of "box cards" that shows the order of stations to respond to this box and the locations near it. Phantom boxes are also sometimes used to show what Fire Companies "Move up" or fill in at other stations during multi-alarm incidents. A actual "Phantom Box" Card. Still in use. This goes back to the fire boxes. When the fire was out the Battalion chief, or his driver, would go back to the alarm box. 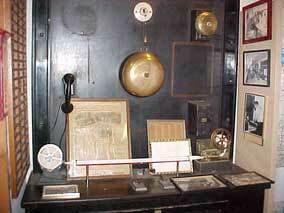 He would use the telegraph key to send a signal that all companies at "Box 213" were clear because the fire was out. He would "tap out" this signal. All the watch personnel at all the stations would note that this fire was tapped out. In some cities the code for under control was "1-1" and the code for all companies clear was "6-6".